Finding the right electric toothbrush for your child is critical to their oral health. Small children need more gentle electric toothbrushes because their teeth and gums are still developing. Older children can handle stronger electric toothbrushes, but not quite on the same level adults can. One of the best things you can do for your child is to buy a quality electric toothbrush that removes all the plaque and debris they can’t reach themselves. That’s why we’ve compiled this list of 10 of the best electric toothbrushes you can buy for your children. Read on to learn what makes a toothbrush suitable for your little ones and what features you need to look out for to ensure what you are getting is top quality. The Philips Sonicare Electric Rechargeable Toothbrush for Kids is gentle on children’s teeth and features multiple brush heads that differ in size to accommodate your child. It also has multiple speed settings so that kids can brush comfortably, no matter how old they are. To help kids brush properly, the brush features two timers: one to signal that they are done brushing, and one to let the child know when they should start brushing another part of their mouth. To keep things interesting, the brush also features customizable faceplates so that kids can design their toothbrush any way they want. This Oral-B brush stands out from other toothbrushes in a big way. The toothbrush features a rechargeable battery that last for 5 days on one charge, making it perfect for road trips. As your child brushes, the toothbrush also plays one of sixteen songs as a gentle reminder of when to change from brushing the top of the mouth to the bottom and vice versa. 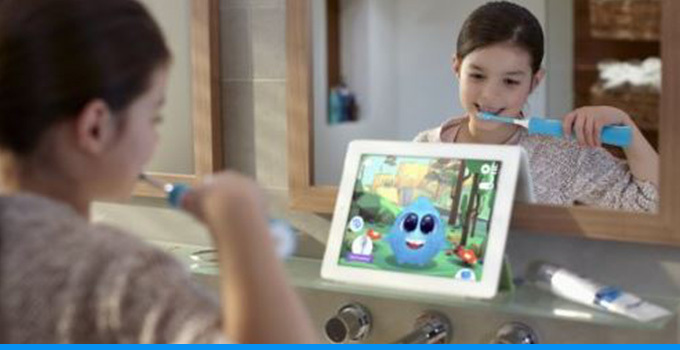 It’s also compatible with the Disney Magic Timer App, a smartphone app that gradually reveals a picture as your child brushes their teeth. The only downside is that the brush only goes at one speed. This tooth brush may seem exactly the same as the first toothbrush on this list, but the two could not be more unique. This toothbrush actually has Bluetooth and a smartphone app that lets you track your child’s brushing habits. It also helps educate your children about the importance of dental care by treating it as a game. 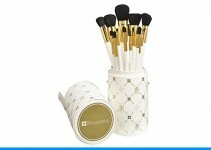 If they brush correctly, they get rewards on the app that they can use to customize Sparkly, the app’s “pet.” This brush has all of the features of its brother listed above, including the removable faceplates, multiple speeds and 2 minute timer. This dainty pink toothbrush is far more than just looks. Oral-B is one of the most recommended toothbrush brands on the market, both for children and adults. All it needs is one AAA battery and you’re all set. The brush stays on for exactly two minutes to make sure your child brushes thoroughly, then shuts off when time is up. The brush speed is excellent for toddlers, meaning toothpaste won’t splatter everywhere if your child needs to take the toothbrush out at all. The only downside to this one is that you can’t change the brush head, which is disappointing. Don’t let this toothbrush go, especially if your child has braces. 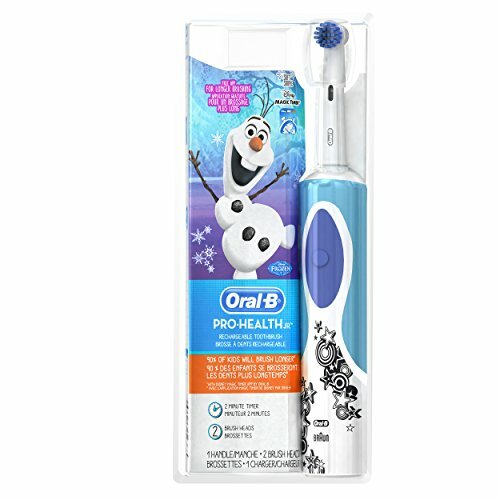 The Oral-B Frozen Kids Electric Rechargeable Power Toothbrush made it onto our list because of its specialized brush heads. This toothbrush’s heads are specially designed to clean both teeth and braces; perfect for growing kids. Like most Oral-B products, the toothbrush also features a special rechargeable battery that is impossible to overcharge, meaning you can leave it on the charger all day long. 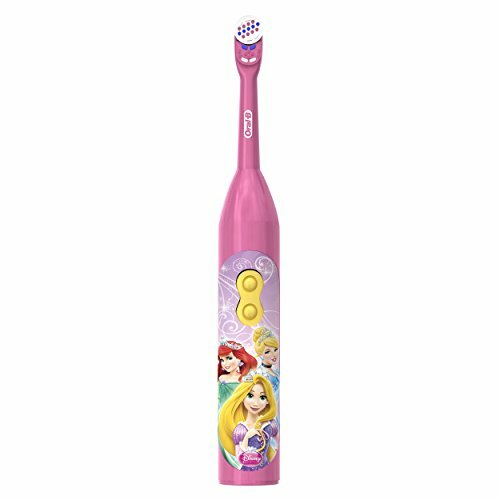 While the toothbrush doesn’t have a timer, you can download the Disney Magic Timer App, which will reveal Anna and Elsa as they brush their teeth. 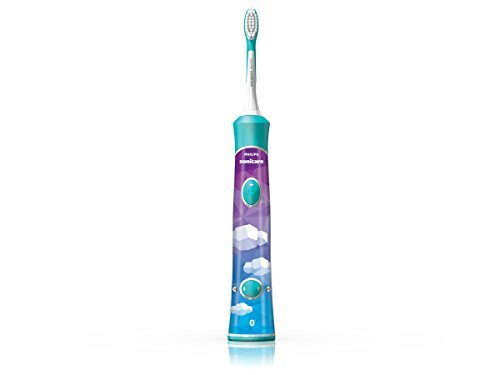 This toothbrush is also compatible with the Disney Magic Timer App, so you already know that this brush will keep your kids brushing for the full 2 minutes recommended by dentists. 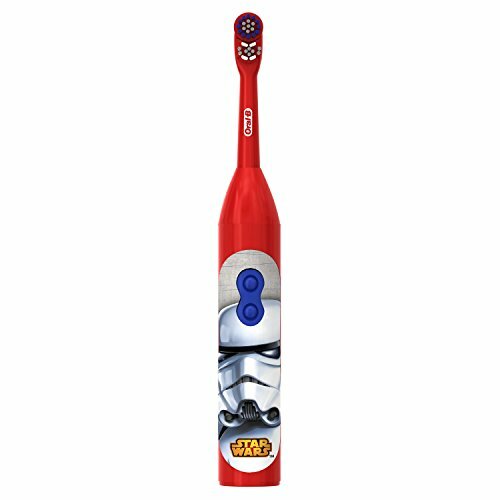 This toothbrush is available in three styles: green with Yoda, red with Darth Vader and red with a Storm Trooper. This brush features a simple on/off switch, but some customers have complained that the brush head is a little large. This toothbrush also does not have a replaceable brush head, a vital omission. The upside is that this toothbrush is inexpensive and only requires two AA batteries to operate. 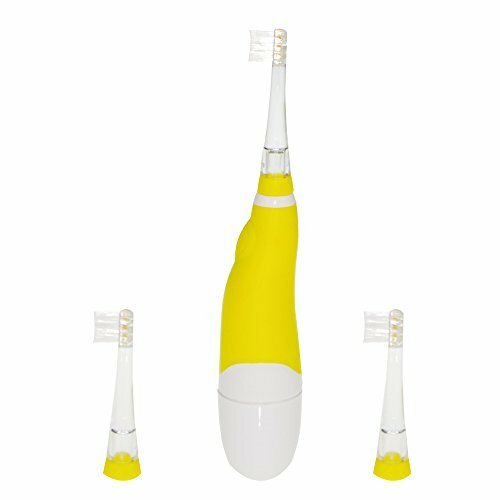 This practical toothbrush includes a built-in LED light, located under the brush bristles. This is so that parents can examine their child’s mouth as needed, just to make sure no cavities are developing. This toothbrush is completely waterproof, meaning you don’t have to worry about damaging any delicate electronics. 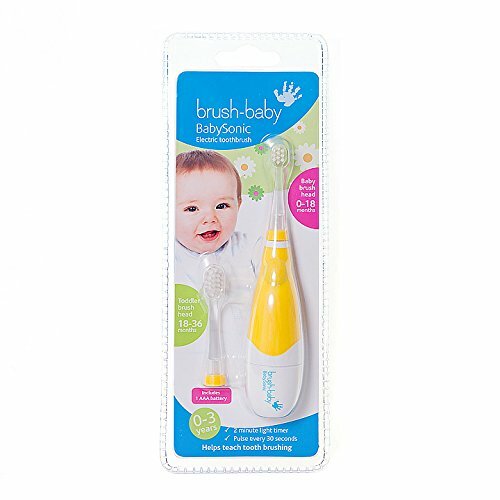 The brush goes at a gentle speed with gentle vibrations, perfect for toddlers. All it needs is one AAA battery and you’re set. One inclusion that we found invaluable is that the toothbrush also has a cap, excellent for keeping germs off of the brush head when it isn’t in use. Designed for children 7 years and older, the Colgate Kids Powered Toothbrush averages 20,000 brushstrokes per minute, making it quite powerful. 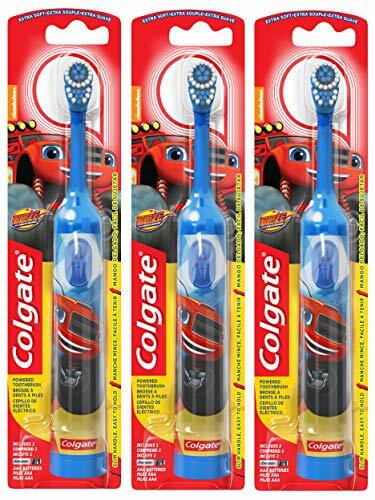 Come parents report having no problem giving this toothbrush to four and five-year-olds, meaning the speed is gentle enough and the brush head soft enough that it will not irritate children’s gums. It comes in several colors, including purple, blue, red and lime green. It only needs one AAA battery to work and is much quieter than your average electric toothbrush, despite its power. The downside, however, is that it only goes at one speed and lacks a replaceable brush head. As you may expect, the Brush Baby BabySonic Electric Toothbrush is great for brushing babies’ teeth, but that’s about it. This brush is designed so that parents use it on their babies. It just needs one AAA battery to operate. 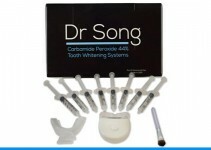 It comes with one additional brush head and a bright built-in LED light for inspecting teeth for problems. The brush has two timers built-in: one for 30 seconds to indicate when to move to a different part of the mouth, and one for 2 minutes to indicate when brushing is done. Unfortunately, the brush head doesn’t spin; it only vibrates. At more than $10.00, this toothbrush may seem pricey at first, but it isn’t. This odd-looking brush comes with two extra brush heads so that you don’t have to worry for quite some time. This toothbrush lasts for quite a while as it is, with one battery lasting as much as 150 days. It is also completely waterproof and has a built-in LED light as well. This brush also has two timers: one for 30 seconds and one for 2 minutes. Bear in mind that this toothbrush is very small, and not practical for a child over three years old. 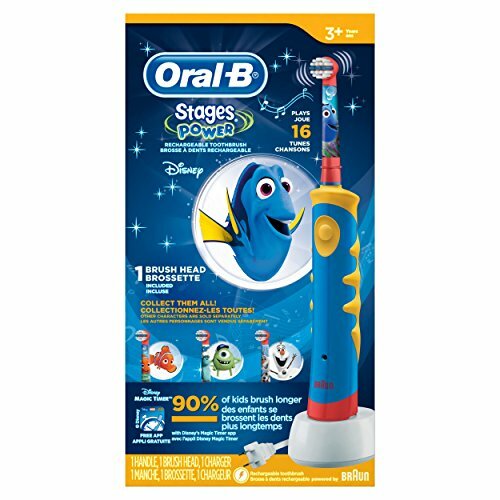 As you can see, picking out a good electric toothbrush for your child isn’t as easy as finding the one with the cartoon character they like. Children don’t necessarily have the hang of brushing their teeth like adults do, which makes a toothbrush that will help with that invaluable. They also can’t always apply toothpaste to the toothbrush easily, so a toothbrush that will remain stable for them while they do so is another valuable feature. It is also important to bear in mind that children’s teeth and gums are still developing. Anything that is too hard on their mouths will not only discourage them from brushing, but it may also damage their mouths.